THURSDAY, Dec. 6, 2018 (HealthDay News) -- Despite three decades of declines in secondhand smoke exposure, 58 million Americans -- children included -- are still breathing in tobacco fumes, federal health officials reported Thursday. Nearly 40 percent of children aged 3 to 11 are exposed to secondhand smoke, as are nearly 50 percent of the poor and almost 40 percent of people living in apartments, according to the U.S. Centers for Disease Control and Prevention. "The good news is that secondhand smoke is down since we started measuring it in the late 1980s," said Brian King, deputy director for research translation in the CDC's Office on Smoking and Health. Nearly 90 percent of Americans were exposed to secondhand smoke in 1988, but that number dropped to 25 percent in 2014, he said. "The bad news is that we still have marked disparities across population groups, and we haven't seen any change since 2011," King added. The dangers of secondhand smoke are well-known. Secondhand smoke contains more than 7,000 chemicals, including some 70 that can cause cancer, the CDC team said in background notes. Secondhand smoke can also cause sudden infant death syndrome (SIDS), respiratory infections, ear infections, asthma attacks in infants and children, as well as heart disease, stroke and lung cancer, the researchers pointed out. Each year, exposure to secondhand smoke causes more than 41,000 deaths from lung cancer and heart disease among nonsmoking adults and 400 cases of SIDS, according to the 2014 U.S. Surgeon General's Report. In the new study, the researchers used readings of cotinine levels, a marker of secondhand smoke found in the blood, from the 2011 to 2014 National Health and Nutrition Examination Survey. They found that the number of people exposed to secondhand smoke did not decline among most groups. That could be because many states have still not enacted laws that forbid smoking in workplaces, restaurants or bars at the state and local levels, the researchers said. Only 27 states and the District of Columbia have such laws. Since 2014, however, some laws have been enacted in local areas that might eventually trigger more reductions in exposure to secondhand smoke. From 2015 to 2017, nearly 200 communities adopted comprehensive smoke-free laws and another 21 have implemented these laws since July 2018, according to the report. Children's exposure to secondhand smoke usually happens in homes when parents smoke. 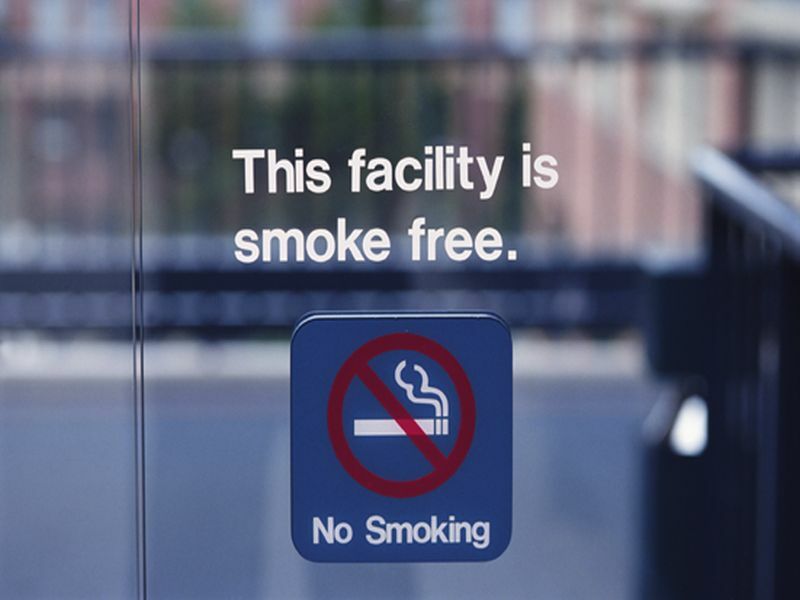 Exposure also occurs in apartment buildings and public housing where smokers live. Exposure should decline in public housing, however, as the U.S. Department of Housing and Urban Development adopted a rule requiring public housing to be smoke-free after July 31, 2018. Since laws banning smoking in public places have been enacted, "private places like homes and vehicles are the last bastion of places where people can smoke cigarettes," King said. Among blacks who don't smoke, half are exposed to secondhand smoke, including 2 out of 3 children. Among people who don't smoke and didn't graduate from high school, 3 of 10 are exposed to secondhand smoke. Among people living in a home with a smoker, 7 of 10 are exposed to secondhand smoke. The report will be published Dec. 7 in the CDC's Morbidity and Mortality Weekly Report. Although fewer adults are smoking cigarettes than ever before, too many Americans are still exposed to secondhand smoke, said Thomas Carr, director of national policy at the American Lung Association. "Exposure continues to be prevalent in certain populations, and we need more smoke-free laws," he said. Proven ways to reduce exposure to secondhand smoke include laws that prohibit smoking in workplaces and public places, along with smoke-free home and car rules. Educational programs warning people about the risks of secondhand smoke are effective, the CDC researchers said. The U.S. Centers for Disease Control and Prevention has more on secondhand smoke.